How is my pool heating connected? Newbie! I am due to start a SLAM on my pool - hopefully over the weekend. First time i have had a pool so this is all new to me so excuse any silly questions i may ask. I have got to know how the pool side of things run however one thing i am a little confused about is how it all connects to my gas heating. 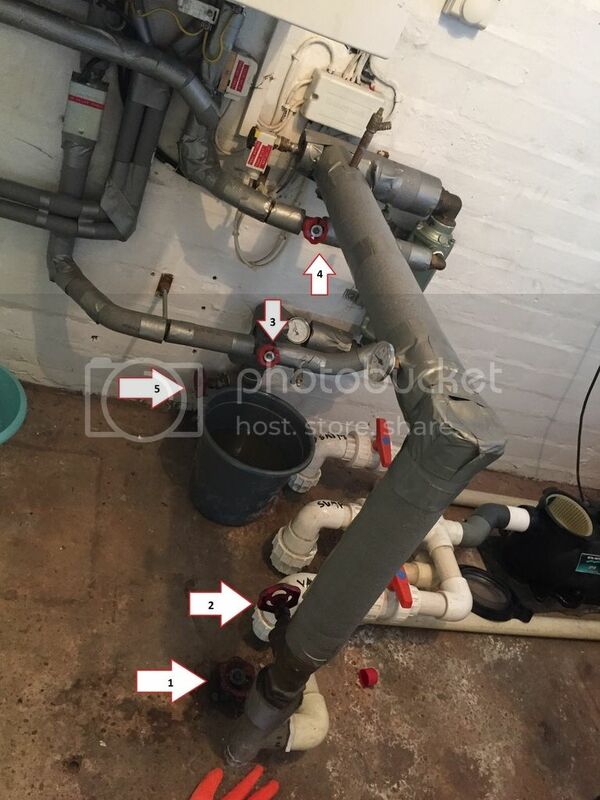 I have 2 pipes coming out of the filter .... one goes into the ground - can i be correct in assuming this will go to my sewer ? (no screw tap connected to this). The 2nd pipe connects to a big cover insulated pipe. TAP2 & TAP3 create a loop in the central heating system, they are also connected to some type of (i think) heating exchanger (you can just about see this on the pic). From this 'heater exchanger' there is another pipe which connects to TAP5 (as there is a label on this saying OUT i assume it goes to the pool. TAP1 AND TAP5 both line up if im looking in a straight line on the floor. Strange - TAP3 is closed, if i open TAP4 it empties the water out my boiler system via the water release valve (which i assume was opened by the previous occupants). Im a little confused as to why it would be linked to the boilers water system? surely it should be separate? TAP1, TAP2, TAP5 are jammed solid at the moment, not sure if they have been left open or closed! OK an hour or so of scratching my head, i think i may have worked it out. I think thats it? any other suggestions would be good. Glad you figured out the rest, I was getting nowhere fast!